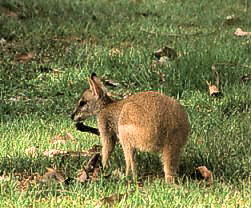 Agile Wallabies seem to be very common in the Top end, we came across them a couple of times. 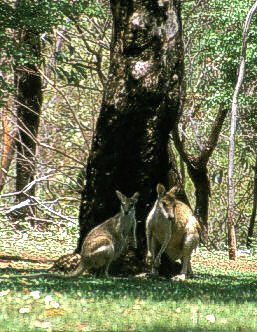 The picture on the left hand side was taken near Katherine gorge, the other one in the Kakadu resort. As in many (all?) other kangaroo and wallaby species the male Agile is much bigger than the female, so I'd say we see a couple on the left hand side. The hotel skippy seemed to be still young.